Johnathan Thurston has become only the third player to win the coveted Golden Boot twice after clinching a poll of 13 leading Rugby League figures. The Australia and North Queensland Cowboys stand-off edged out England forward Sam Burgess to win the title for the second time in three years. 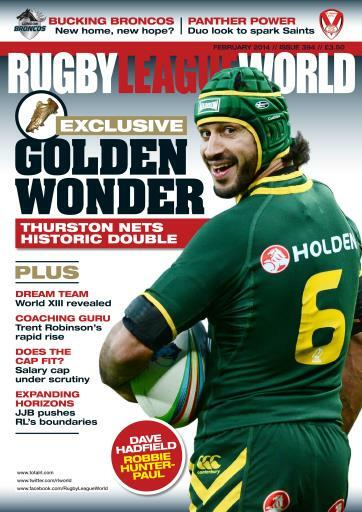 Only Andrew Johns and Darren Lockyer have achieved that feat before, and Thurston was rewarded for an outstanding World Cup campaign in which he played a significant role in the Kangaroos’ triumph. Rugby League World gets Thurston’s reaction from Down Under, as well as revealing the World XIII, voted for by the same 13 judges. Elsewhere in a packed edition, Ian Ramsdale lifts the lid on a turbulent few months for London Broncos that will hopefully now see a brighter future in Barnet. Jamie Jones-Buchanan sits down with Rugby league expansionist Lionel Hurst, we ask if the salary cap has a future in Super League, and catch up with new St Helens signings Mose Masoe and Luke Walsh. In the Championship, we uncover the remarkable story of the team of volunteers – most of them pensioners - building two new stands at Featherstone and spotlight Rochdale Hornets’ coach Ian Talbot. And we also provide our usual news from the Academy scene, women’s game, Australia, New Zealand, France and Wales as we look ahead to a fascinating 2014.